GRANT, ULYSSES S. (1822-1885). American Civil War general and 18th president of the United States. ALS. (“U.S. Grant”). As president. 3pp. 8vo. Long Branch, August 8, 1870. On his blind-embossed monogrammed stationery. 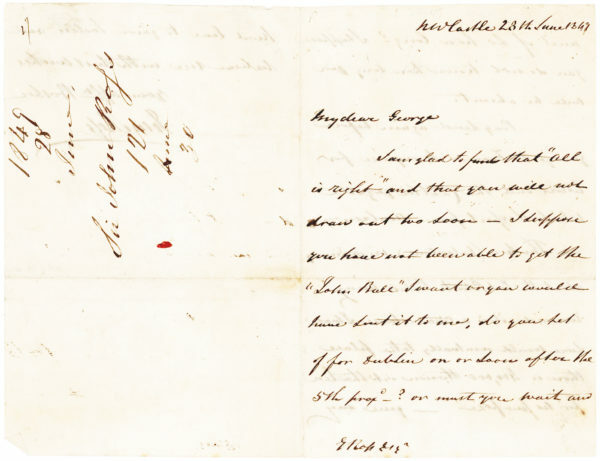 To LADY JANE FRANKLIN (1792-1875), devoted widow of the arctic explorer, Sir John Franklin (1786-1847), who perished while attempting to navigate through the Northwest Passage. A Royal Navy officer, Sir John Franklin had already completed three Arctic expeditions between 1819 and 1823 before setting out to traverse a previously unknown portion of the Northwest Passage. The 59-year-old veteran explorer assembled a crew and two ships, the Erebus and Terror, both of which became icebound in the Canadian Arctic. The fate of the vessels, last sighted at Lancaster Sound near Baffin Island in July 1845, was shrouded in mystery for many years. From 1850-1857, Franklin’s wife, Jane, herself an accomplished traveler and explorer, outfitted five search teams to locate Franklin and his 129-person crew, whom many believed were still alive. In 1854, Scottish explorer John Rae heard Inuit tales of cannibalism amongst Franklin’s crew. Rae’s report to the Admiralty was leaked, angering Jane Franklin and the public, which had come to regard Franklin as a hero and was captivated by his widow’s devotion to locating her missing husband and his crew. In 1857-1859, Admiral Francis Leopold McClintock commanded a search expedition aboard Jane Franklin’s yacht the Fox. 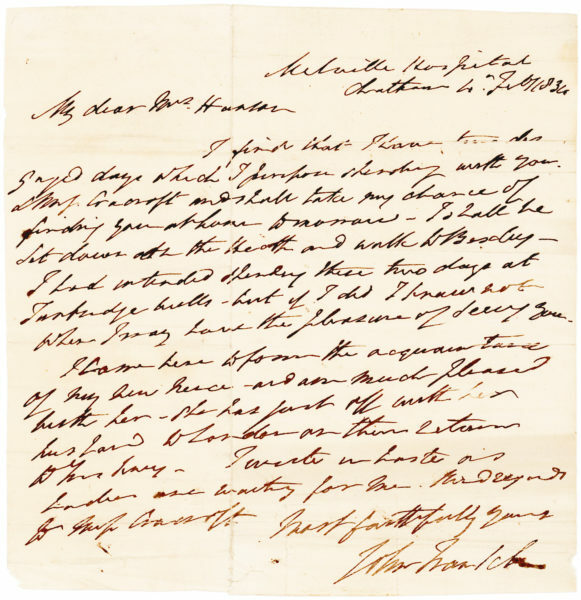 Traveling to the North Magnetic Pole and King William Island, he and his crew found several skeletons and corpses, a boat, and a written record from Franklin’s expedition. 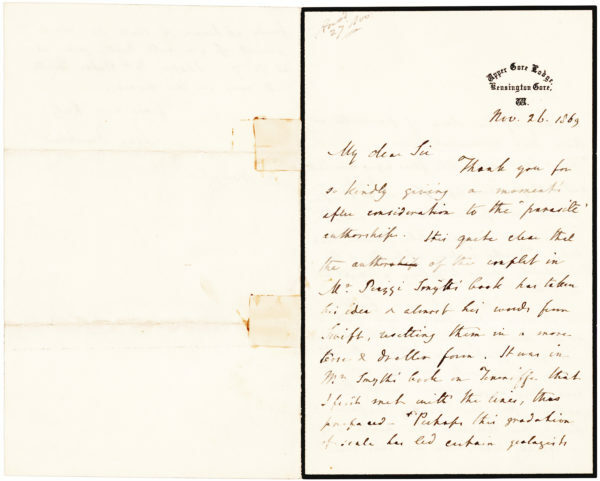 In 1859, he published The Voyage of the ‘Fox’ in the Arctic Seas: A Narrative of the Fate of Sir John Franklin and His Companions, the book Grant mentions in our letter. Among the 25 expeditions that set out to discover Franklin’s fate, two were headed by Cincinnati newspaper publisher and explorer Charles Francis Hall. During his first, from 1860-1863, interviews with natives led him to believe that members of the expedition might still be alive, but on his second voyage, lasting from 1864-1869, reports to the contrary led him to conclude that the crew had starved to death. 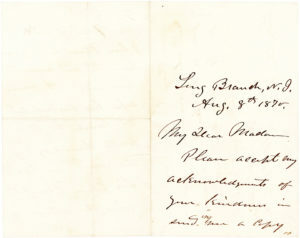 At the time of our letter, Hall was promoting the Arctic Resolution, legislation that would authorize Congress to fund an American expedition to the North Pole. 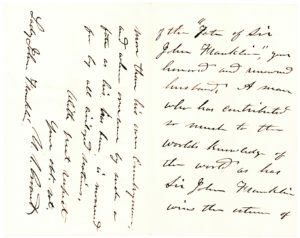 Hall had already visited President Grant in Washington and convinced him of the merits of his proposal. “Grant showed genuine interest in Hall’s bold plan for reaching the North Pole, for he himself had an impressive knowledge of the history of Arctic exploration…[He] offered the explorer one of his custom-made cigars, and they had both lit up and had a grand talk about the best route for the expedition, the determination that would be needed to reach the Pole, and the physical deprivation that would be faced. These were engrossing topics to Grant, a born fighting general who never lost his tough edge. 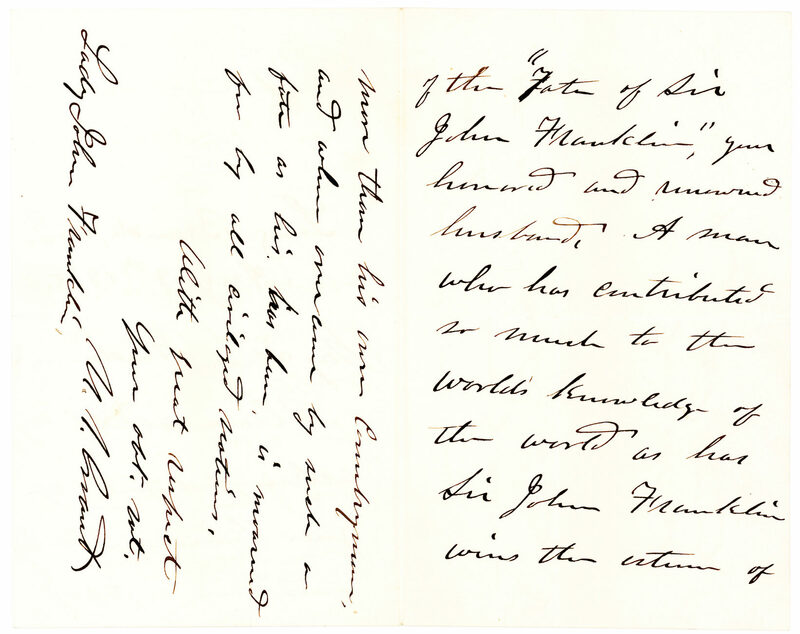 In Hall, Grant immediately saw someone of vision worth backing, and the President would never waver in his support, publicly or privately, for the man who regaled him that day with stories of the Arctic,” (The New York Times review of Fatal North Adventure and Survival Aboard USS Polaris, the First U.S. Expedition to the North Pole by Bruce Henderson). In 1870, believing that members of the expedition might still be alive, 77-year-old Lady Franklin traveled to the United States with the purpose of meeting Hall in person. “In Cincinnati, Ohio, and later in New York [Lady Franklin and her niece] achieved the great object of their journey, interviews with Hall…. At the time of their meetings, Hall’s plans to try for the North Pole had been formed, but he evidently agreed to renew later his search for survivors on or near King William Island,” (“Griffin, Jane,” Dictionary of Canadian Biography). It was during the same trip that Lady Franklin traveled to Long Branch, New Jersey, to visit President Grant on August 6, just two days before he wrote our letter, in the company of Grant’s friend, political supporter and publisher of the Philadelphia Public Ledger, George W. Childs. With Grant’s support, Hall’s Polaris expedition, set sail from the Brooklyn Navy Yard in June 1871. However, Hall died aboard the Polaris, likely poisoned by his mutinous crew, a fact swept under the rug by the naval board of inquiry, which wished to avoid a scandal. “In 1875 Lady Franklin financed one more mission to the Arctic. Its goals were to discover further records of the Franklin expedition and sail through the Northwest Passage. The Pandora set sail on June 25. Just three weeks later Lady Franklin died at the age of 83. The Pandora’s mission was unsuccessful, and the ship returned home in October,” (“The Lady & The Queen,” Hana Hou!, von Buol). Lady Franklin’s undying loyalty and perseverance, synonymous with the mention of her name, are immortalized in Westminster Abbey’s monument to her and her husband. “Using the latest in technology, including underwater imaging, and assisted by the oral histories of the Inuit, Franklin’s flagship, HMS Erebus, was discovered on September 7, 2014. Two years later, on September 12, 2016, Canadian researchers announced that they had discovered Franklin’s HMS Terror. The ships are about thirty miles apart and far from their last reported positions. Both have been described as being in remarkable shape,” (ibid.). 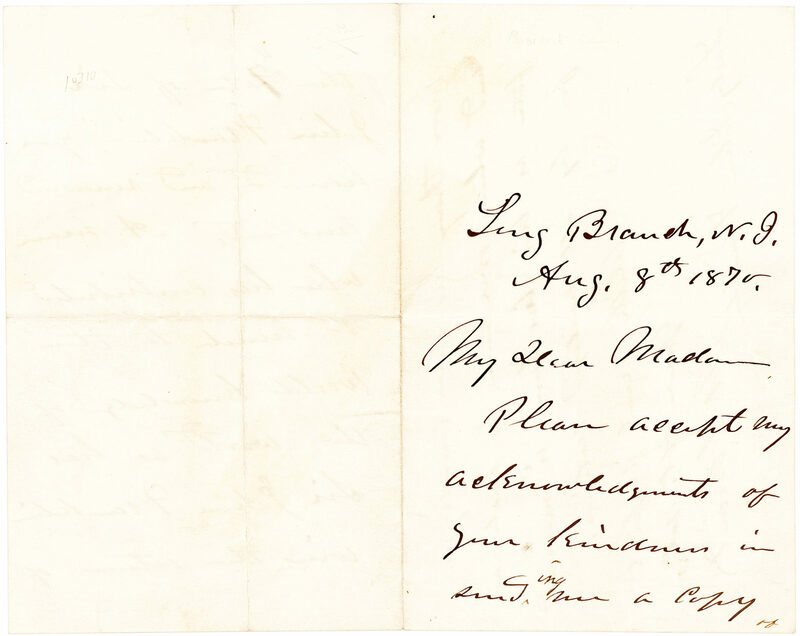 Grant’s tenure as president ran from 1869-1877, and while in office, his “vacations were likely to be spent in a cottage at Long Branch,” New Jersey, where he penned our letter, (DAB). Published in The Papers of Ulysses S. Grant. Folded with normal wear and in excellent condition; a wonderful association. 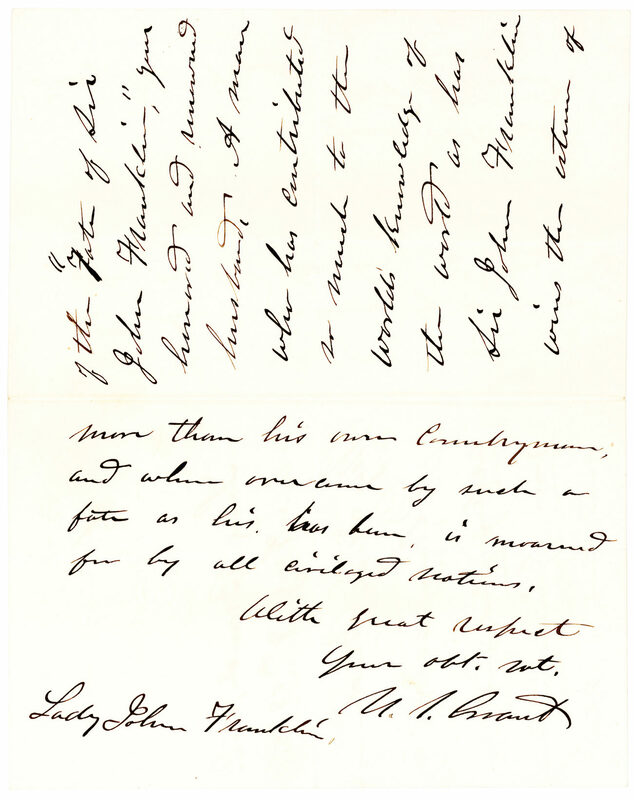 Content letters of Grant as president are rare.